For the first time in six years, neither of my kids is on a travel, or select, sports team. My son is in high school and participating with the high school sports teams. While travel team-esque, it is different. Meanwhile, my daughter found out that there were not enough players for there to be a girls travel hockey team in her age group for the upcoming season. She’ll be playing in the house or recreational league. It’s not a big deal to me or her–she’s only eleven after all. But our sports situation this fall made me realize just what a terrible travel sports parent I have been over the years. I do not think my child is the best player on the team and tell other parents, the coach, the other team, or post about it on social media. I do not want my child’s travel team to play in a tournament–and pay for a tournament–every weekend. I’m not obsessed with trophies, medals, and personalized shirts and sweatshirts from tournaments. I do not complain to the coaches after every game about my child’s playing time or position. I have no strong feelings about matching sweatsuits, bags, or other travel team swag. I’m done with fundraising so my tender pumpkin can have a higher quality experience, aka enter more tournaments or get fancier team swag. See? I’m a terrible travel sports parent. I really should have ratcheted it up when my kids were on travel teams! What about you? Any terrible youth sports parent behavior in your past? I did once call a referee a “stupid head” and another parent on my team turned around and shamed me by reminding me that we all signed a code of conduct at the beginning of the year. Whatever. He was a stupid head. Wait. 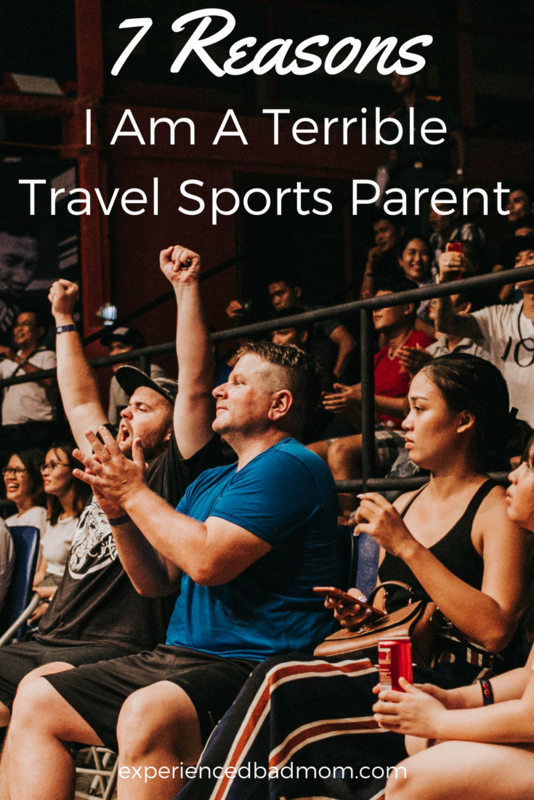 Maybe there’s hope for me to be a terrible travel sports parent after all! Right there with you on this! Oh, don’t get me started. I have SO many stories of observations of abhorrent parental behavior when it comes to sports – particularly swimming. I won’t launch into them here. However I ran into two of my kids’ previous coaches the other day and was told by one of them that this was her last year as a coach. The first words out of my mouth? “Oh, you won’t miss the parents.” She burst out laughing. Yup. The parents won’t be missed.